The town of Bénodet was defended by two Stýtzpunkte at either side of the Odet river mouth. Western point was Pointe de Combrit (Qu 54), eastern side le Groasguen (Qu 57). Strategic importance of this point is the fact that the Odet river leads to Quimper, one of the major towns in this region. Both Stp are identical in Regelbauten with a 630 and 631. The eastern bank has turned into a residential area so the two bunkers disappeared. 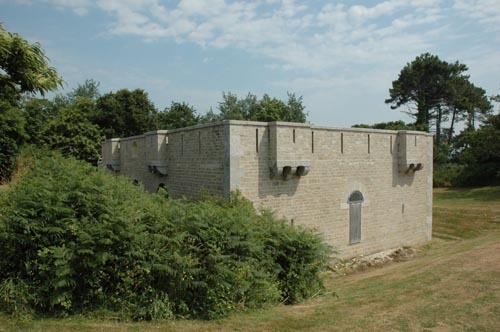 The renovated fort at Pointe de Combrit. Site of Qu 54.